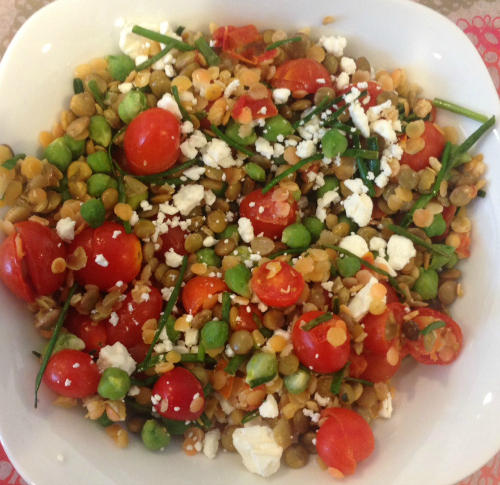 Home » To Be Categorized » Green Garbanzo Beans, Lentils and Veggies! Green Garbanzo Beans, Lentils and Veggies! Sometimes work and life gets so busy, that having frozen food in stock is essential to making healthy choices. 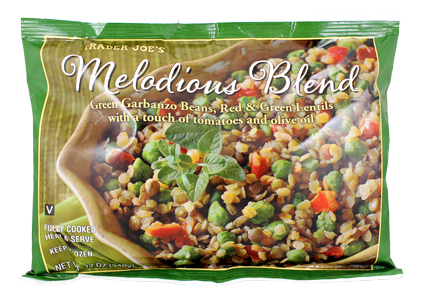 Trader Joe’s has a variety of healthy meals that fit the Mediterranean diet and can be prepared in minutes. Here’s one to enjoy, the Melodious Blend – frozen green garbanzos, red and green lentils with a touch of tomatoes and olive oil. Pour Melodius Blend in a sauce pan over medium heat with 1/4 cup of vegetable broth and a tablespoon of olive oil. Wash and cut cherry tomatoes in half. Cook for 6-7 minutes stirring continuously. Add fresh chives by cutting them into the pan with kitchen scissors. Then add cherry tomatoes. Cook for 1 more minute. Place in bowl and sprinkle in feta. 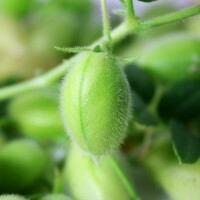 Comment on Green Garbanzo Beans, Lentils and Veggies!